Friday/Saturday nights are ‘Takeout Night’ – where you order a curry or pop to the local fish and chip shop. Weekends also typically involve more social occasions, drinks out with friends, meals out, etc, etc. If there’s ever a time when people are likely to blow their diet and over consume calories it’s at the weekend! I see it all the time, a person eats well Monday to Friday, creates a calorie deficit and loses weight, but then over the weekend they consume a gazillion calories and their weight returns back or goes up! This obviously isn’t the way to do things if you want to lose weight or keep yourself trim. 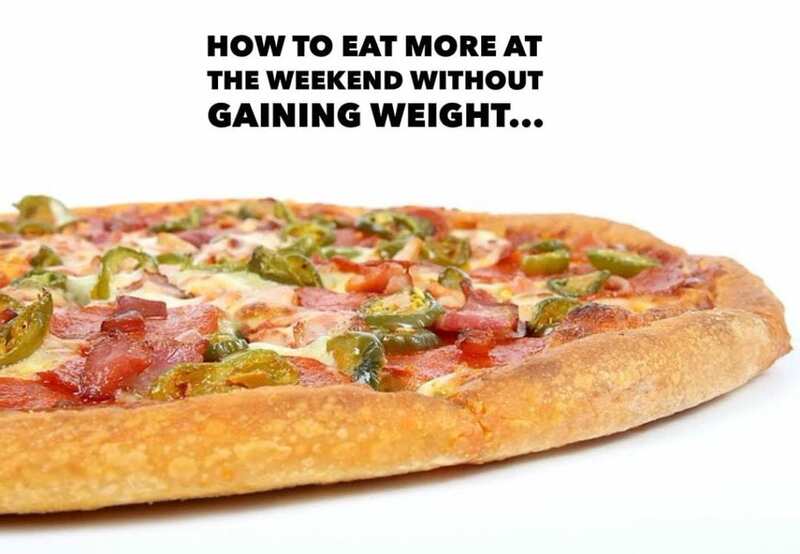 In this post i’m going to teach you How to get away with eating more food at the weekend without gaining weight. We will look at what you need to do with both ‘exercise’ and ‘nutrition’ in order to keep the pounds off! One of the best ways to burn calories and use up stored fuel in your muscles called ‘glycogen’ is to lift weights. After a good weights session you will deplete your working muscles of energy and make room for some extra calories to fill them back up. If you are going to eat more at the weekends then make-sure you make-room for the extra calories! One of the best ways to do this is to increase the number of reps and sets you do in your gym workout. For example, when you go to the gym on Saturday and Sundays perform 15-20 reps per exercise. Select exercises with a high output, things like deadlifts, squats, bench press, burpees, pull ups, etc. These exercises use more muscles than isolation lifts, therefore you are going to be burning more overall calories in your session. You could pick 5 different exercises like the ones above and your workout would only take 25 minutes (5 minutes per round). EMOM can be a really effective way of getting in lots of reps, and burning a whopping number of calories. A pizza or chocolate bar won’t make you gain weight! But if you overeat them they will! If at the weekends you are drinking lots of wine, eating takeaways, sweets, and all the other high calorific treats but not keeping track of what you are eating and how many calories you are consuming – you will gain a sh*t load of weight. Every Saturday I give myself 1,000-1,500 calories of my choice to use on foods that I typically wouldn’t eat everyday: pizza, curry, burgers, etc. Once i’ve used up those calories that’s it! Don’t go overboard, set yourself a limit and stick to it. Even though a pizza and burger would be classed as a cheat meal, the difference between the calories can differ greatly. For example for a standard sized burger and chips you’d probably be looking at around 700-1,000 calories per meal. For a large Dominoes pizza you could be looking at 3,000 calories! Although both meals fill you up, one is 3x more calories! Look for meals which satisfy your cravings but ones which are more conducive (calorie wise) to your weight goals. You could consume 800 calories per day Monday to Friday but then eat 10,000 calories on the weekend (easily done!) and your average calorie intake for the week would be 2,000 calories per day! For most that will take them out of a calorie deficit and even though you’ve been disciplined Monday to Friday you’ve blown all of that hard work at the weekend! Be smart and be consistent. Weight loss is simple, calories in vs calories out. Don’t confuse or overcomplicate the process. Stick to the numbers and pick foods which provide you with more bang for your buck and have less calories than processed foods: vegetables, fruit, lean meats, fish etc. If you eat like this 80% of the time and fit in 20% treats you will get results. If you can’t eat like this… you need to ask yourself ‘why’ and figure out whats holding you back. More often than not it’s an emotional and habitual issue – I will be talking about this more over the forthcoming months so stay tuned. If you benefitted from reading this post please give it a ‘thumbs up’ or ‘share’ with a friend.